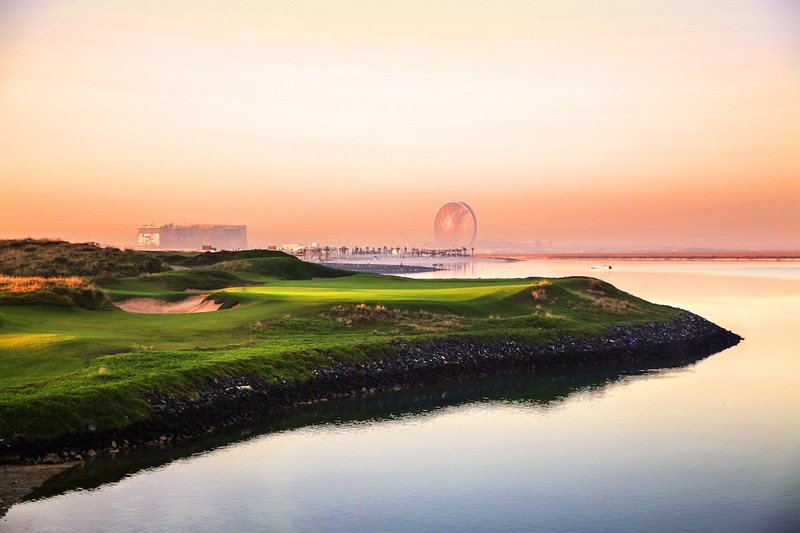 One of the more unique developments of recent years, Yas Links was created by the Aldar Property group of Abu Dhabi, on partly reclaimed land beside the Persian Gulf. 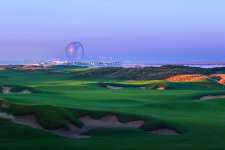 Aldar, one of the largest landholders in the Emirates, own more than 12,000 acres of Abu Dhabi including the 10 square mile Yas Island, upon which the course was built. Yas Island itself is a super ambitious $40 billion man-made development noted for leisure attractions like Ferrari World and its custom-built Formula One racing circuit as well as its pure sand beaches, luxury hotels and high-quality golf course. The course was designed by American Kyle Phillips, on a narrow strip of land beside a series of salt marshes and shallow sand estuaries that feed directly into the Gulf. Phillips was given the very rare privilege here of being able to shape his own coastline during the dredging process. Not surprisingly, rather than choose a straight edge to his landform, he opted instead to build a series of small coves and bays as well as an effective mini-Peninsula on his back nine. The result is a stack of great coastal golf, with eight holes essentially running along the shoreline and another with a green pushed back near the water. 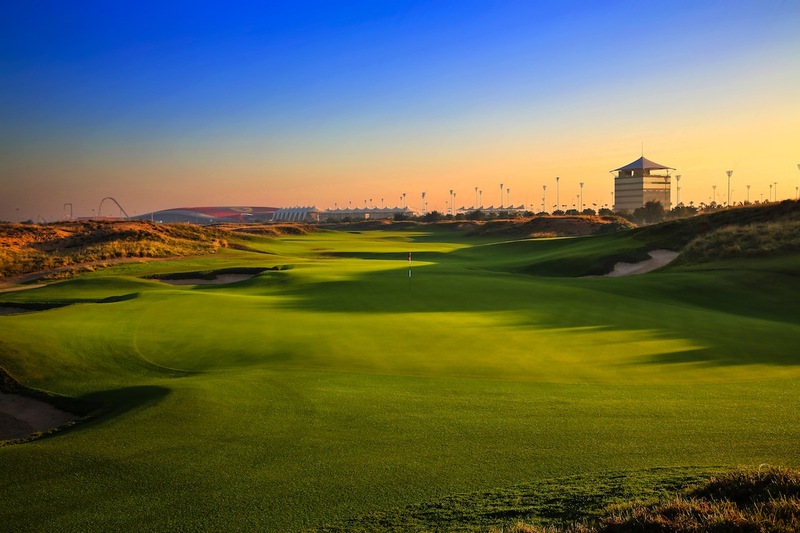 The Phillips routing at Yas Links has really been the key to its success. Both nines are essentially arranged in a skinny out-and-back figure eight, allowing the golfer to experience the breeze from a range of different angles and for the water to play on both his left and right side during the round. Each nine ends along the shore, but in different directions so that slicers who fear the waterside 9th, for example, should have fewer concerns on the hook-side 18th. Although there are a number of fine holes on the front side, the back has both more drama and beauty as well as slightly more believable faux-dune structures. The links theme is also accentuated further through the building of some quality lumps and undulations within the fairways, and the creation of a classic double green site shared by the 12th and 15th holes. The large step in the middle of this green is equally effective at feeding brave balls toward rear pins on the 12th as it is at directing overcooked shots away from the hole on the 15th. Individual highlights at Yas include the quartet of very distinct par threes. Aside from the 4th, which plays inland to a busy pushed-up green, the others are all along the water and vary both in length, orientation and the manner in which the hazard seeps into golfers consciousness. The 13th is the shortest and all about a precise strike, while the longer 8th and 17th have bail areas on opposing sides and test your ability to ignore the liquid and balance the need to remain brave whilst not being foolish. Of the longer holes, not surprisingly those that hug the shoreline are the most unforgettable. In most instances the risk taken from the tee is commensurate with the reward given inside the fairway, of a more straightforward approach shot. From the narrowing finger of land that the right-bending 9th tiptoes along, to the beautifully bunkered 14th, wedged into the southern tip of the site, these dangerous water holes provide the core golfing challenge here. Pleasingly, the inland holes are equally strategic and also blessed with very appealing undulations and, at times, exaggerated green contours. Among the standouts are the par five 7th, the first to turn back toward the clubhouse and play up and over a very serious ridge shoulder, and the charming mid-length 10th, with its clever central bunker and attractive green area. 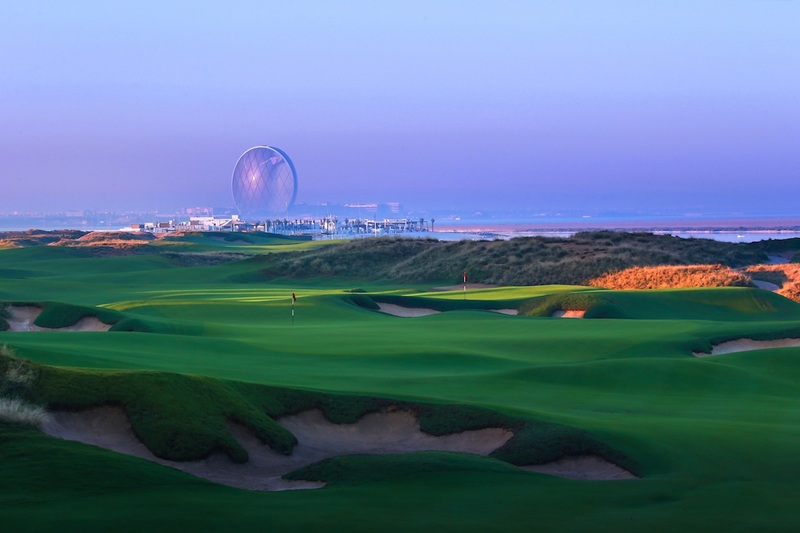 Yas Links was an important project for Kyle Phillips, and a chance to show that design ideas honed in more traditional golf markets could be translated into a hostile environment like the Middle East. Aside from the lack of cool season grasses and firm, bouncy turf the chief difference between Yas Links and Kingsbarns is the shaping and base topography, which was much flatter here than in Scotland and therefore with fewer inland views. The shaping is also a little different, in that at Kingsbarns most of the earth was moved to open up the outlooks whereas at Yas much of it was moved to screen golfers from either cart paths or ugly development around the periphery. 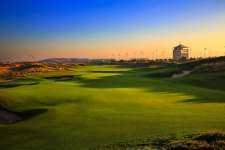 Yas Links certainly doesn’t suffer from these differences, and if anything benefits from the heightened excitement felt when presented with a new coastal scene for the first time. The fact that you don’t expect the 14th or the 17th or the 8th to be quite as beautiful until you arrive is quite a thrill and makes a game at Yas ever more pleasurable.